“The Business Change Leader is in an office building. It is a building of 100 stories—one for every year of its existence. “This building is on fire, everywhere. The structure is collapsing. “This is not the Business Change Leader’s first fire. He is dressed head to toe in the best firefighting gear, covered in soot, fighting the fire. “Colleagues walk by him without helmets or gear, on their way to get a cup of coffee. They have no idea the building is on fire. Or perhaps they rationalize that, for now, the fire is acceptable. They have never been in an office building fire. But that doesn’t stop them from telling the Business Change Leader that he is holding the hose the wrong way! “The situation is getting worse. The flames are spreading. The top floor has caught fire. A news crew shows up to report on the fire. Another person walks by and complains that there is no more coffee. But this building has always been safe?!? “Looking at the fire, some people wonder if their lives are in jeopardy. But they don't believe that this can be true because this office building has always been safe and has always been plenty big enough to survive any fire, even this one. They assume the fire will just go away tomorrow... or maybe next month at the latest. “As the Business Change Leader continues to survey the situation, He sees fire hoses everywhere. Most people are just stepping over them, not picking them up, not turning them on. Some others have been holding hoses for a while; but now, they are dropping them because their efforts don’t seem to be making things better. ‘The Owners of the office building arrive on the scene, and they—like their colleagues inside the building—believe the fire is not life-threatening. For some reason, they feel the heat even less than those inside the building. “Someone comes up and asks the Business Change Leader to measure the fire and demonstrate how dangerous it might be. When he answers, they twist his comments to minimize the threat, ‘The fire is dangerous, but we have confidence in our firefighters ability to turn it around and the building’s ability to withstand the fire.’ So, according to them, everything is okay. “As the Change Leader continues through the halls, the foundation is buckling and someone has started to build the 101st floor in an attempt to escape the fire. Finishing her story, the Wise Woman turns to us and smiles patiently. “The office building is a Company in transformation. It’s a 21st Century kind of fire. 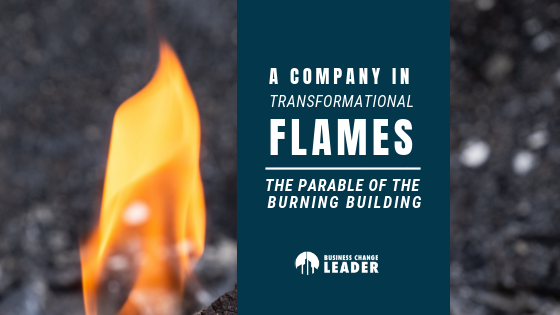 But, the Company can do nothing about this transformational fire until enough of the leaders wake up to the reality that it is a life-threatening situation. “The Colleagues getting cups of coffee and coaching the firefighter on how to hold the hose are oblivious to the fire. They are the Company’s employees who are either unaware or indifferent. They are not helping the situation and only getting in the way of the need for a life-saving Company transformation. They have not recognized, nor learned that life threatening situations require that we do something unique, skilled, and tangible to make a difference. These Colleagues are stuck in the past, focused on what’s been lost, and they are likely to obstruct the others who are taking action. These Colleagues also believe that the building can sustain the fire. These employees believe the past is a predictor of the future. But this situation is different, and past successes are not a guarantor of future success. Furthermore, your current skills won't save you. You must rapidly build new skills in order to successfully navigate this complex situation. The News Crew is the public, the observers, the friends and family of the company, owners, and employees. If that’s you, your voice can help to create the awareness that is needed in the owners and employees to wake up and make a radical change. “The people dropping the fire hoses and giving up are the ‘A players’ who have worked hard to make things better, but who have lost faith that their leaders, their fellow employees, and company can survive this fire. Before you give up, before you leave a Company in need of transformation, take a good look in the mirror. Is there any way you might be able to help the leaders and employees wake up to see the fire the way you do? If not, maybe your departure will be the wake up experience they need! “The people lighting new fires are the most problematic of all because they are unaware of how their actions impact their environment. Their behaviors likely created the deadly situation in the first place. The best action you can take is to sit down with your most trusted Colleagues and ask them for some straight talk on what they need to stop doing and what they need to start doing in order for things to get better. “The person wishing to measure the fire to determine the level of danger is the bureaucrat whose procedural focus is not helping in this emergency situation. No one has ever measured their way out of a fire fast enough to save his own life, nor the lives of others. This is a time to get real, feel the heat, and challenge yourself and others to wake up and feel the heat as well. “The person building the 101st floor is critical to the survival of the Company. They need a strategy to find stable ground on which to build a new business if the current one is falling apart and cannot sustain itself. “The Owners of the office building are the Board Members. Most likely, they don't have a good view into the realities of the situation. They are being kept from the details. Numbers actually can lie. The reality is only truly known by feeling the heat and seeing the fire for what it is. With that, the Elder Woman rose to her feet and left us. We looked at each other, pondering her words. Some of us took the Old woman’s story to heart by looking inside ourselves to determine what we had to do and be differently in order to change for the benefit of ourselves and our own Companies. We embraced our own need to grow, stepped into the uncertainty, and took on the role of the Business Change Leader. Others of us, shrugged off any responsibility, rationalizing our inaction, convinced that our current “way of doing” and “way of being” was right. We retreated to our comfort zone because the uncertainty was too uncomfortable, willing to wait for someone else to do something different. 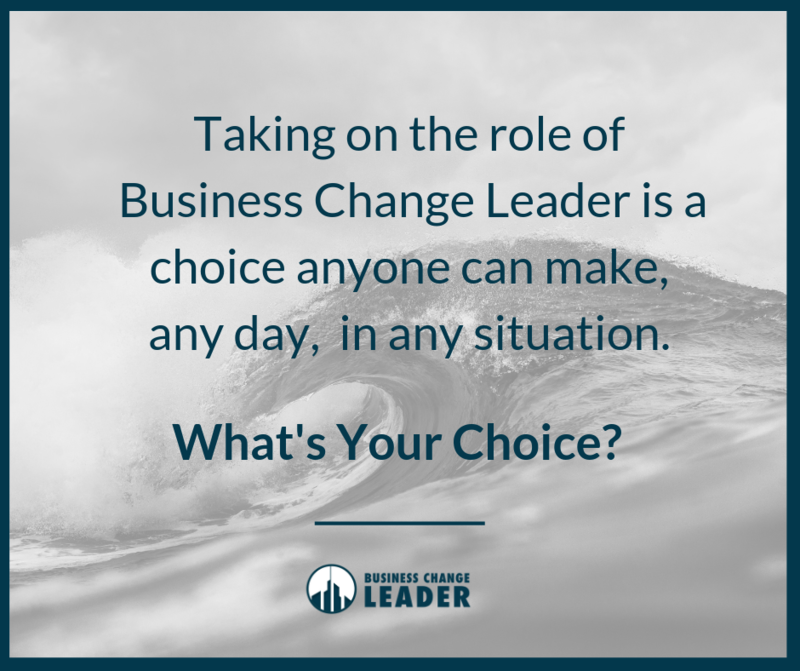 Taking on the role of the Business Change Leader is a choice anyone can make, any day, in any situation. What Are Your Best Business “Canaries”? And, How to Avoid Organizational Denial.